Shake Them Rattles… And Bones! So many kids love Halloween and this particular holiday invites you to explore things that are fantastic, creepy or even a bit scary! So why not add some musical rattles to your slightly spooky fun? 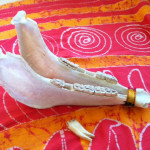 And this recycled project is doubly scary, because it’s based on an actual set of bones – a jawbone to be exact! 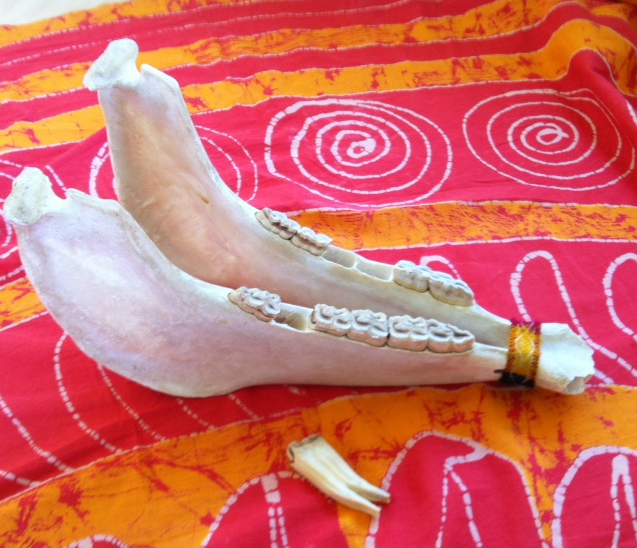 The quijada (this word means jawbone in Spanish) is a real musical instrument made from the jawbone of a donkey. It’s a part of Afro-Peruvian music and keeps the beat by making the sound of teeth rattling in their sockets- like the teeth you see here (to the left). Most often it is played by striking it on the side of the jawbone with your fist but you may also see someone running a stick up and down the rows of teeth as seen here: http://multikidsmusicvids.com/?p=1530 . 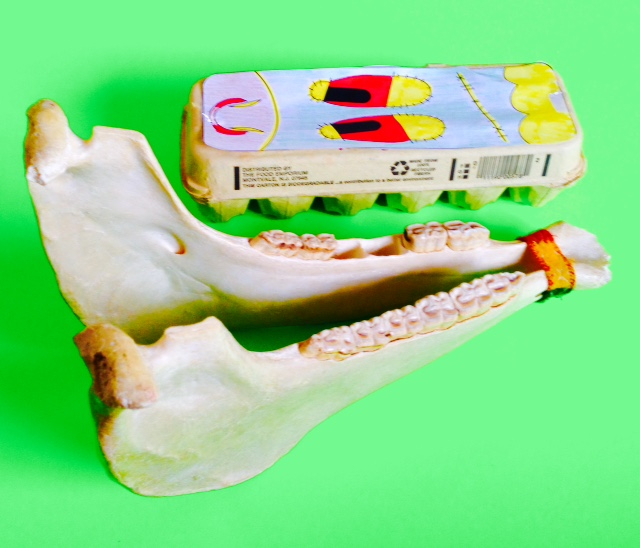 Since most folks won’t have access to jawbone and probably would not want to play one, we’ve created a version of this instrument from a recycled egg carton. You get to pick what take the place of the teeth in each of the 12 spaces of the egg carton. Try marbles, pebbles, rocks, pine cones, paper clips, beads, erasers buttons or any other object that that fits easily into that space. 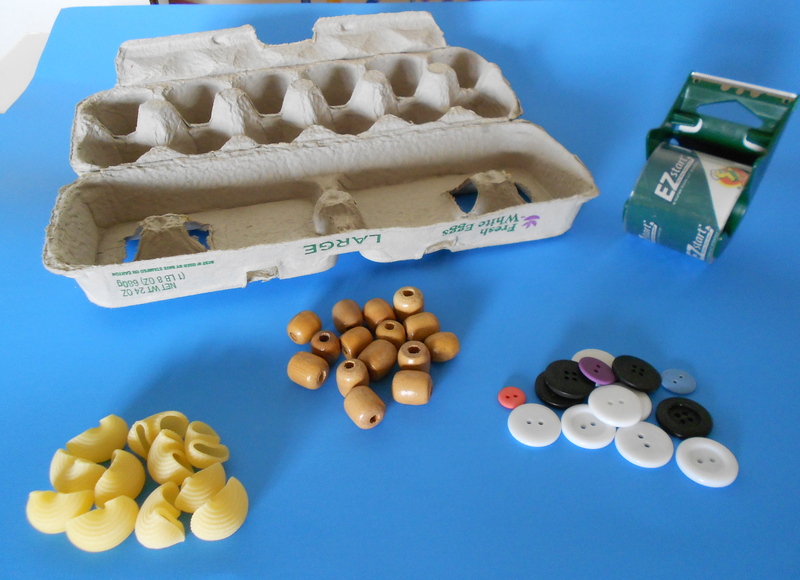 One look at the empty egg carton and it’s easy to see how to incorporate counting and sorting skills into the creation of this musical rattle. Don’t rush to complete and close the rattle. Stay and play at this stage as long as you like. 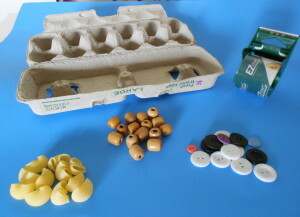 And since each set of objects will make a distinctly different sound, you can fill the rattle (or several egg cartons) several times and discover the different sounds each set of items makes when placed inside. 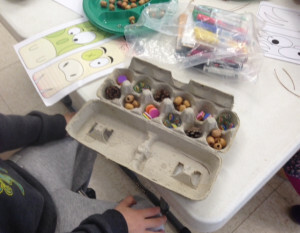 Will a paper clip egg carton rattle sounds the same as a marble rattle? No way! Last but not least, your rattle will need a great funny face. The activity pdf below has a series of full color and colorable images that range from scary to super-silly. Or create your own by outlining the top of the carton and designing away! And since some egg cartons have holes in them, we suggest taping the finished rattle up with clear packing tape so none of the small pieces can escape. 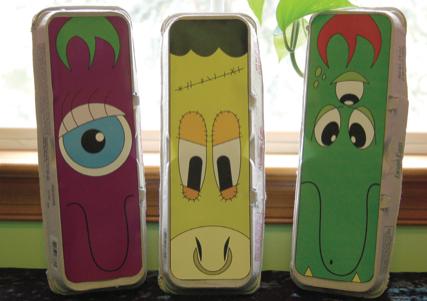 Then, all that’s left to do is make some scary noises with the rattle and have lots of Halloween fun!